Remy Ma is Coasting Into Her Final Trimester Still Fly! VH1‘s Love and Hip Hop star and Rapper Remy Ma (real name Reminisce Smith) is about 6 months along in her first pregnancy with husband Shamele “Papoose” Mackie. 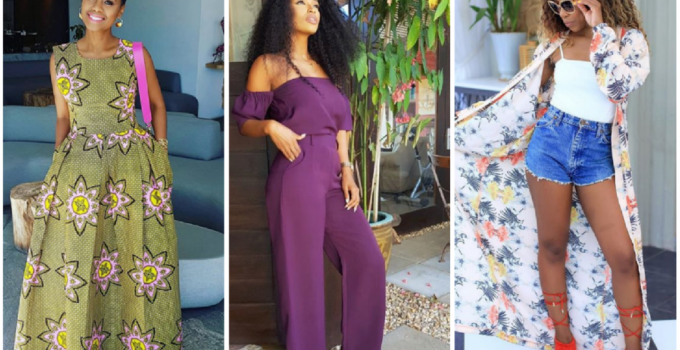 However, the pretty cocoa-complexioned vixen and business woman has not yet “popped”, if you will, and is sporting still a pretty chic and sveltish figure in her cute collection of clothing. Judging from the pics the Dark and Lovely spokeswoman and brand ambassador has posted on her social media pages, you can barely tell that she and her hubby of 10 years will be welcoming their first child by year’s end. They suffered a very much public miscarriage and since she became pregnant, Papoose has had a hard time containing his excitement about becoming a parent. The couple announce the baby news to guests attending their garden vow renewal ceremony earlier this year. 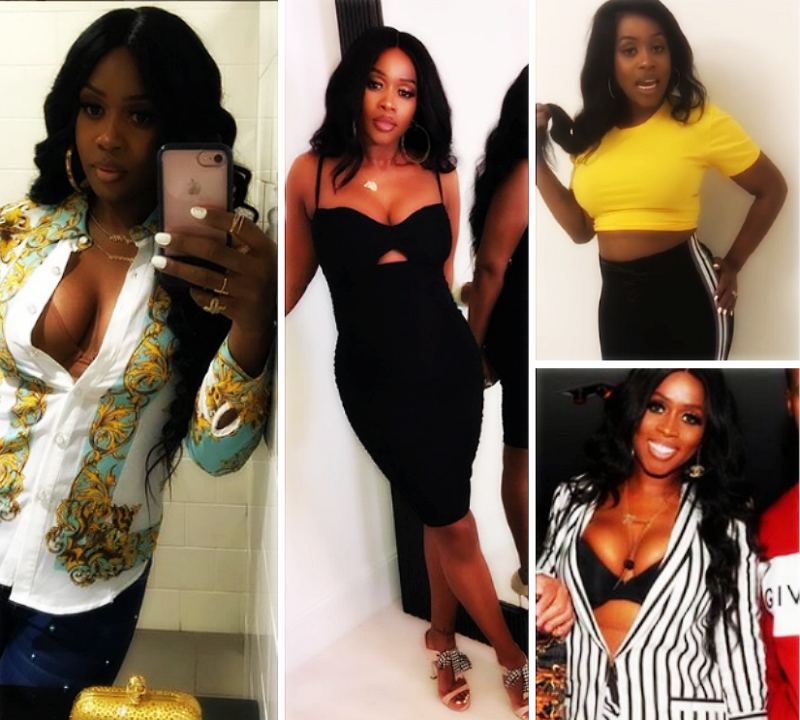 Remy Ma already has a 17-year old son Jace from a previous relationship and Papoose has a daughter 13-year old Dejanae Mackie. Rapper Remy Ma‘s husband Shamele “Papoose” Mackie could possibly be the most excited expecting celeb dad around by the looks of his social media posts about having his first child with his wife. The Love and Hip Hop star announced in July this year that she is expecting and the baby is due in December. The “Melanin Magic” performer posted recently about giving her spouse a hard time about his ecstatic joy, meanwhile he jokes about her posing for photos in social media in a way to shield her bump. 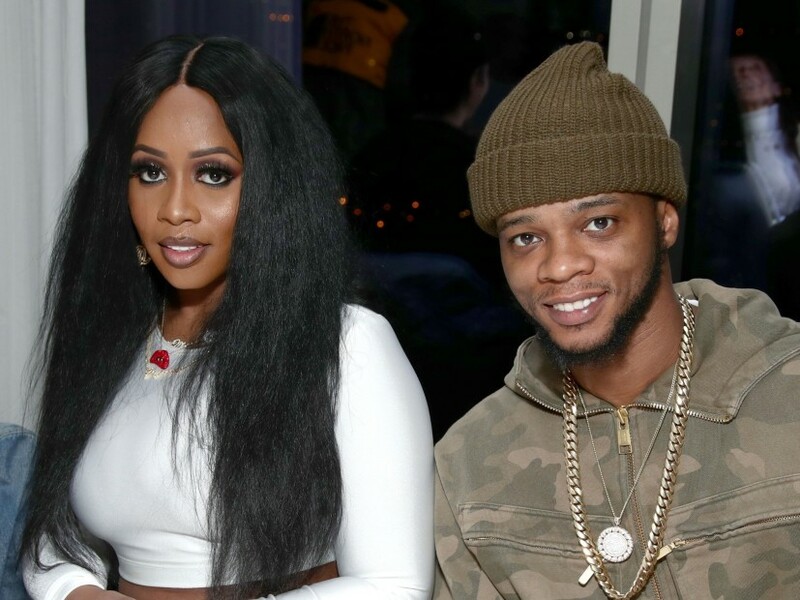 In an adorable video, Remy Ma(real name: Reminisce Smith) performer shared on Instagram, she said that even though he was giving her grief, she felt elated to see her husband so excited about her pregnancy. This is true especially given the couple suffered a miscarriage (or maybe more) before undergoing IVF treatment to get pregnant successfully. Watch the video above to see her bump! The couple announced the news of the pregnancy during a garden vow renewal ceremony. First Janet Jackson in 2016 then Beyonce in 2017 and now Cardi B has canceled a much anticipated tour and performance due to her pregnancy. The hip hop star shared the news yesterday following a performance at the University of Massachusetts, Amherst. 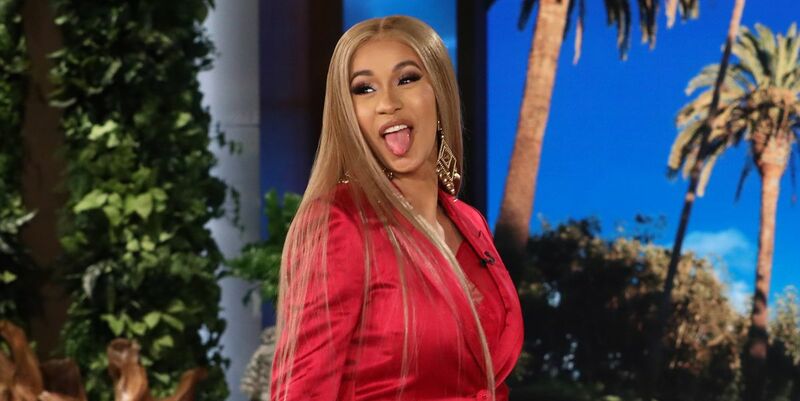 Cardi, real name: Belcalis Almanzar, alerted fans of her final performance too. “Hey guys after Broccoli fest I won’t be doing no more performances .Thank you for understanding 😘love yaaa” she captioned the video. The change of plans comes a few days after Bardi told Jimmy Fallon on his late night talk show during her historic co-hosting gig that she planned to work until the baby arrived. 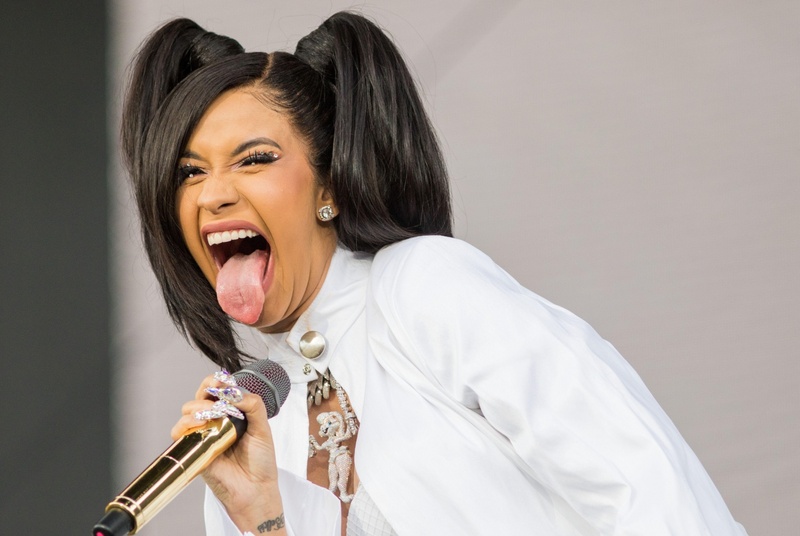 Just yesterday, she shut the show down at the Tinder Presents: Cardi B performance in the Mullins Center at the UMass, a prize to the college for winning the dating app’s “Swipe Off” contest after making the most “swipe rights” compared to other competing schools. 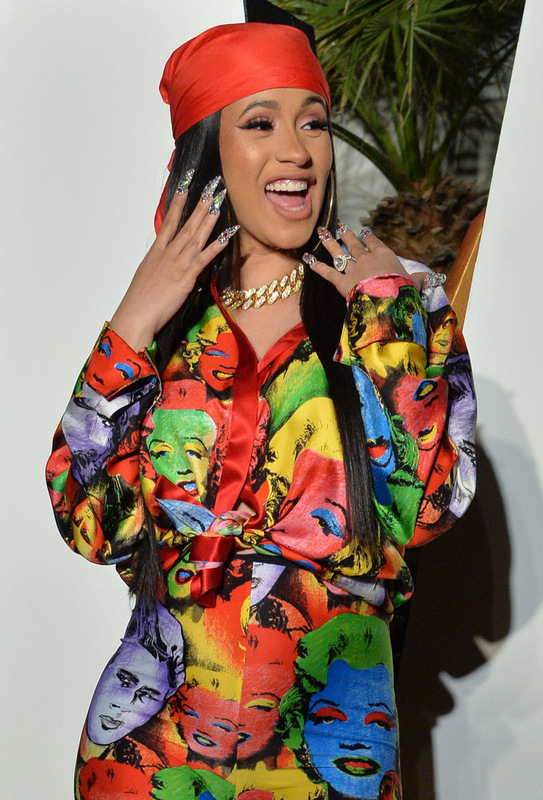 Cardi wore a asymmetrical red and white pinstripe shirt over shorts to the performance. The Bronx-native rapper first gained social media attention openly discussing her career as a stripper which made her Instagram famous. She eventually landed a casting role on the VH1 TV series Love & Hip Hop: New York between 2015 and 2017, but she really started to get some fame after getting an Atlantic Records deal. Her first single, “Bodak Yellow,” hit the No. 1 spot on the Billboard Hot 100 chart – making her only the second female rapper to steal the top spot with a solo track. Cardi’s debut studio album, “Invasion of Privacy”, was released last week and entered as the number one record on the Billboard 200. It features “Bodak Yellow” as well as other notable singles “I Like It,” and “I Do,” featuring SZA. 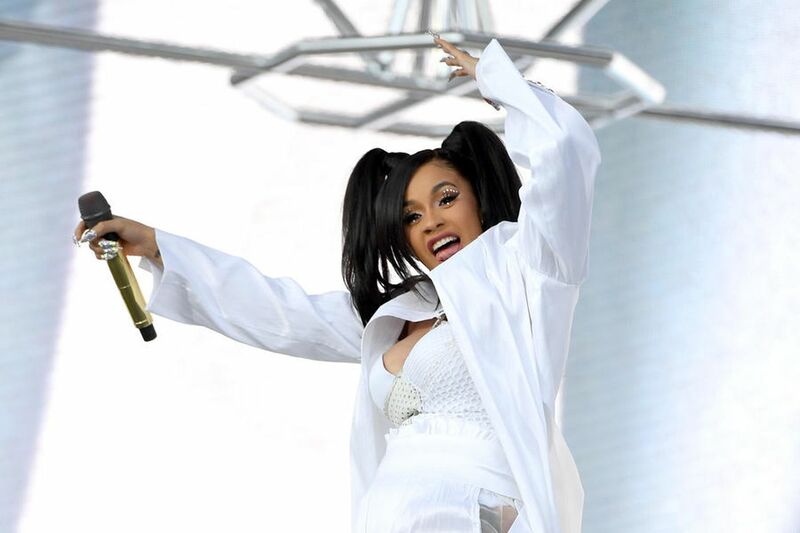 Earlier this month, Cardi B announced during a performance on Saturday Night Live that she was pregnant and will be having a baby with her fiancé and hip hop group Migos member Offset. After the news, she said she still planned to tour with Bruno Mars through October, and even twerked during her Coachella performance last week. During a recent appearance on The Ellen DeGeneres show, she said of the Coachella perfrmance that she wanted to show audiences what she did to get pregnant in the first place. She had already canceled the Wireless Festival in July and Variety said that it’s “safe to assume” her July dates, and even potentially some shows in May, will be cancelled when her due date rolls around. 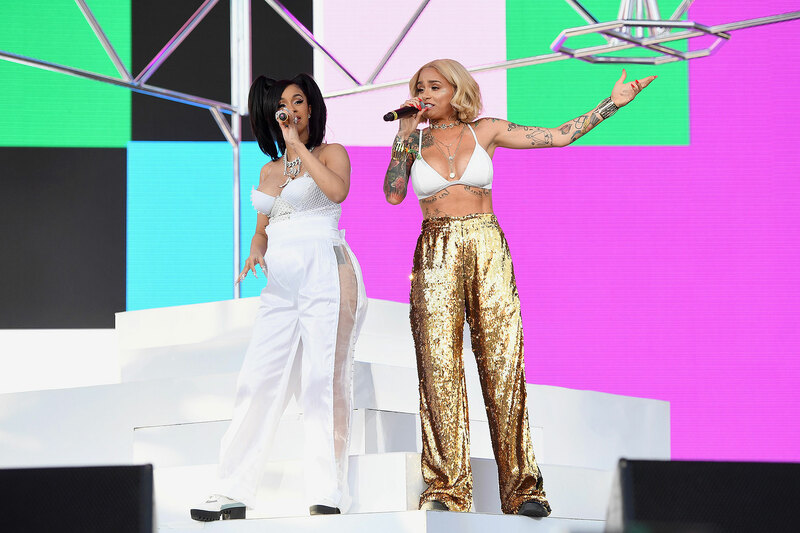 First-time mom-to-be rapper Cardi B made her Coachella debut over the weekend and played a few tracks of her recently released hit album Invasion of Privacy which debuted number one on the Billboard 200. 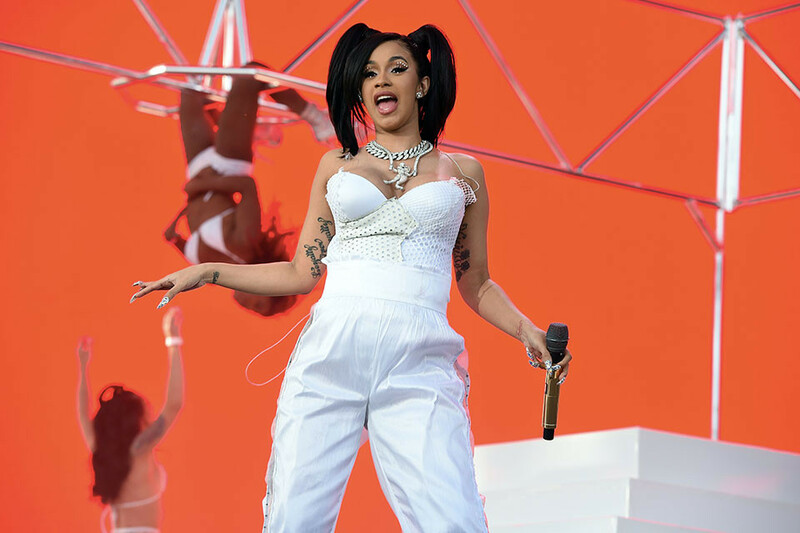 The Bronx native earlier revealed that while she received $70,000 for each of her two performances this weekend, she shelled out an additional $300,000 or more to pay for the set, dancers, crew and other production costs that the Coachella team did not pay for, added to the lost income potential due to a non-compete/performance clause the festival attached to her contract stopping her from performing within a radius of the festival for a period of time. Wow! Not only did she make history recently for beating Taylor Swift’s streaming record, being the first woman to be on 5 songs on Billboard’s Top 10 R&B/Hip Hop charts and the first female solo artist to land on number one of the Billboard 100 since Lauryn Hill, but she also made history as the first host and musical performer to announce her pregnancy on SNL (Saturday Night Live) last week! This mama’s star is meteoric! AND…she twerked and dropped it like no other pregnant performer before her! Another Record! Watch footage of her set below. WARNING: LANGUAGE in some of these videos NSFW! VH1‘s Love and Hip Hop star Amina Buddafly announced she is expecting to deliver in July and recently looked super cute in a periwinkle colored sleeveless bump-hugging dress while attending the Hollywood movie premiere of Meet the Blacks recently at the ArcLight theater earlier in the month. Buddafly, who is married to show co-star “Peter Gunz” Pankey, announced the baby’s gender on Instagram. “Everyone asking me about maternity pics. I’m just over half way there I got a long way to go,” she captioned a photo. “#julybaby” like big sister Cori. The songstress recently had a gig and wore a flowing maxi dress which complemented her well. She also shared a clip from the performance, singing a tune from her latest album. She and Gunz are expecting a son they have decided to name Bronx. He will be the couple’s second child together. They have a daughter named, Cori, who turns two in July. Love this pic from the other day at #springfamilyfest thank u @mskateegrace ?? I was stalking the Instagrammed wedding photos from our Bellyitch Bumpwatch alum Yandy Smith, the music manager and e-magazine publisher who stars in the VH1 show Love and Hip Hop. I stopped at a glorious photo of the beautiful new mom breastfeeding her infant daughter Skylar right before the ceremony. Marvelous! I love Smith’s IG because in all of her photos she comes off genuinely happy and full of life. She seems nurturing, in love with her new husband and children and she embraces her beautiful and curvy new mom body and is confident in her skin even as she amps up her work out routine in recent weeks to gradually get back to her pre-baby size. She’s a great IG follow. This discovery came the day after I also spotted an equally wonderful breastfeeding support IG pic from rapper Chris “Ludacris” Bridges wife, Eudoxie Bridges, who is an independently accomplished woman in her own right, having recently received a Master’s degree and pursuing a Medical degree. The photo featured stacks of breast milk the Gabonese new mom to daughter Candace had recently pumped so dad could feed baby while Eudoxie caught up on some sleep. “Got the supply ready for daddy’s shift ?? #gotbreastmilk #liquidgoldastheycallit #bestdadever #heismrmom #takesnightshifts,” she captioned the photo. I think both are serving as wonderful ambassadors to breastfeeding to their community of followers that include lots of black and African American women. This demo stops breastfeeding earliest out of all other racial groups, partially because of culture stigma. The Centers for Disease Control reports that African Americans are less likely to breastfeed their children. “Black infants consistently had the lowest rates of breastfeeding initiation and duration across all study years,” the CDC statistics note. The Joint Center for Political and Economic Studies reports that Blacks stop breastfeeding sooner than other races, setting up their children for higher incidences of illnesses and diseases that non-breastfed children succumb to at a higher rate than those who were nursed. The report also links higher rates of infant mortality and low birth weight to lack of breastfeeding. There is a taboo about it among the black community, perhaps, and those who nurse for too long are not encouraged or supported and are sometimes egged on to stop breastfeeding after a few weeks or months. Although to be fair, shorter breastfeeding times are also linked to working wage-earning mothers who have little to no maternity leave who all have to report to work earlier. Also, moms who have shorter maternity leave and/or work in settings where they do not have a private place to pump and store their milk for their babies, also stop earlier. So it is great to see influential women sharing their experience breastfeeding which perhaps could encourage more to do the same, if they do not face any other impediment to breastfeeding like low supply, extreme discomfort or other problems. Congratulations to Love and Hip Hop star Emily Bustamante and her long time beau rapper Fabolous on the birth of their second child together, son Jonas. Emily B welcomed the baby about 6 weeks ago and before the birth, the proud papa shared an Instagram photo of himself in the operating room during her C-Section. 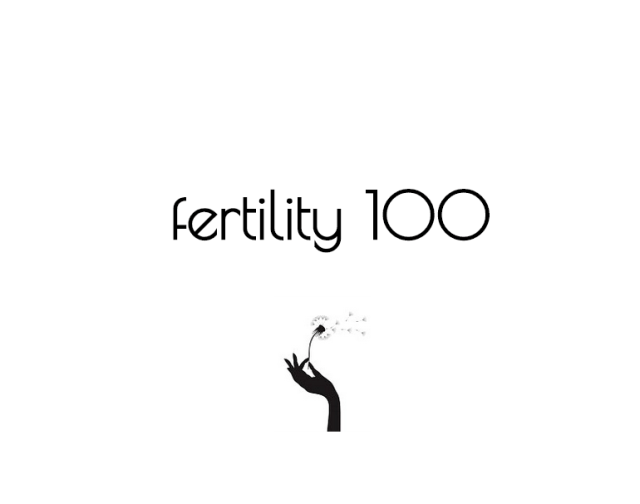 FREE Fertility 100 ebook. Hunting for Top Maternity or Kids Brands? Our Bellyitch 100 is the free resource for you. Baby Shower Shopping? Check out out Top Picks on Amazon or our Gift Guides. Love and Hip Hop star Emily Bustamante had a coed rooftop baby shower with her longtime beau rapper Fabolous in New York City over the Mother’s Day weekend. It was a family affair as the couple’s 7- year old son Johan and Emily’s daughter from a previous relationship Taina also attended. Celebs attending the event, themed “A Little Man Is on His Way”, include celeb DJ and recording artist Angie B, The Real‘s Adrienne Bailon and others. Celebrity photographer Evan Pierce shot the event. Guests were treated to a deelish cake and desserts by Brooklyn NY bakers BCakeNY. Event designers Sweet Inspirations Events did an excellent time teaming up with party coordinator Elizabeth Keily to decorate the event. Guests played Boys v. Girls game of Taboo! How fun! Emily B matched the black and gold colored decorations with a bump hugging off the shoulder long sleeve maxi-gown. Guests went home with a momento from the event via the photo booth on site. What a fabolous celebration! Congrats! Congratulations to Love and Hip Hop‘s Yandy Smith on the birth of her daughter yesterday, Monday January 27. The music manager shared news of the baby’s impending arrival on her Instagram account yesterday. This is the second child for the couple. They have a son, whom they welcomed in July 2012. He has two boys from previous relationships. This lil boy thinks he can fly when we got his hands…matter fact…he can. Fly baby, fly!!! The sky is not even your limit!